I'm still here. I have gotten away from the blogging a little bit in favor for twitter, facebook, and..oh yeah, TRAINING. Next up for me is the Ore 2 Shore 48 mile race in the upper peninsula of Michigan. It's really really far from Georgia, but I've never been up that far and Michigan is my home state. I only know one thing about this race...it will be fast. Really fast. I think the Women's field is up around 75 people! Crazy. Last weekend was ORAMM, which I chose to skip in favor of the closer and free (I don't have a job, remember?) Drama Queen "70 miler" put on by Cartecay Bikes. The start and finish was at Mulberry Gap so the dogs could come along for the trip, too. Perfect! Last year the Drama Queen was Laurie (complete badass) and she won a crown. This year, I really wanted that crown. My plan was to go out hard, like I did at Lumberjack 100..I wanted to see how long I could hold that pace and then back off a bit into tempo or endurance mode for the duration. Laurie was there but said she was doing the 35 miler this year. Loretta and Emily were both also there. Both of them are f-a-s-t.
What a great ride...thanks to Mike Palmeri and Terri of Cartecay Bikes, Larry and Kit for the SAG support, and Mulberry Gap for the hospitality. I hope to be there again next year! 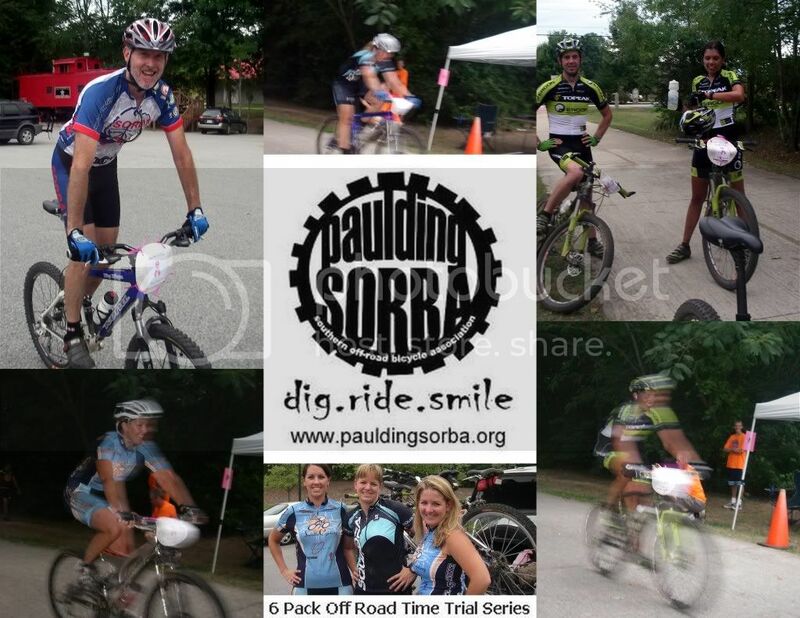 Two days later I decided I felt like taking part in the last of the Paulding SORBA Off-road time trials. The course was 2.1 miles out on the paved rail trail, and then a turnaround onto the Silver Comet Side Trail singletrack for a total of 4.2 miles. On my preride, I got lost..go figure. I went way too far and had a nice 50 minute warmup. On my TT run, I totally missed a fast turn onto a sketchy bridge from the pavement and almost slid my entire body across the pavement. That's the closest I've ever been to crashing on the road! I had to turn around to get back across the bridge and lost some time. My legs were so tired that I could barely turn over the pedals on the last rise before the finish line. It reminded me of the feeling I got in my VO2max test..ouch. I crossed the line in 16:39, 11 seconds behind Al, who was feeling very happy that he beat me. Haha. I decided to go back out for another try since I knew where the bridge was this time. However, I wasn't sure I could even pedal hard on a second try. I was right...I felt like I was pedaling through mollasses the whole time...4.2 miles seemed like forever...my legs were flooded with lactic acid and I caught myself briefly hoping for a mechanical. I think that time was 30 seconds or so slower than my first run. Julia also beat me by 11 seconds and she even crashed on her run! Oh well, it was really fun and hopefully they will do more of these. It's a great way to work on intensity during the week. While I'm at it, I'll put in a request for a local mid-week Short Track series, too. OK? Thanks. Yesterday, as if my legs weren't tired enough....I had a 5 hour ride on the schedule. I was sort of dreading it because I only got 5 hours of sleep the night before and it was looking like rain all day. I needed a stimulating route to keep me motivated so I picked the Paulding County Mixed Loop Ride. It was 40+ miles of pavement, gravel, and singletrack. We parked further down the Silver Comet so added another 20 or so miles of pavement. The ride was pretty slow, but great. The bike is really fun to ride but I do need to change the saddle out. Other than that, the ride was pretty perfect. 5 miles of wet, rooty, rocky singletrack was also a true challenge on a 'cross bike. Great for the handling skills, definitely. 1) Passed the Registered Dietitian (RD) certification exam. That picks up a few more letters...Namrita K. O'Dea, MS, RD, LD. 2) Received the letter that I can start in the PhD program at Georgia Tech next month. I'll be working on my PhD in Applied Physiology. Another cool thing about this is that GT has a collegiate cycling team! 3) Celebrated with some really great friends at The Grange. Tomorrow is officially my first day of "real" vacation. No work, no studying to do. I plan to clean the house since I've neglected that since...oh, probably New Years Day. After that, I plan to thoroughly enjoy the next four weeks until I start school AGAIN for the next 4+ years! YIKES!!! I actually got 15.5 hours of training in this week! That is the most I've ridden in one week (by A LOT) since March. Yes!! The next official race is Ore To Shore in Michigan on August 8. After that, it's Fool's Gold 50. The weekend rides were pretty chill...spent the weekend at Mulberry Gap in Ellijay and finally got to explore some of the Pinhoti 4/Tatum Lead area. Didn't make it to Fort Mountain as planned..next time. Wildlife spotted this weekend: 2 bears (one mom, one cub) and a bobcat! That's enough for me! The Fool's Gold 50/100 preride today was awesome. I only wanted to ride 4 hours (see post a few back about temporary retirement from endurance racing..) so didn't get to ride the whole 50 miles. However, it was an excellent day. The No-Tell and Black Branch trails are pretty rutted and rooty as always, but the Turner Creek area was super buff and fast. The Rotwild R.R2 hardtail really surprised me today. I have really liked it on everything so far, but I had my doubts about the rooty/rough Bull Mt. area trails. It rode so smooth, though! I think I will probably race it for the Fool's Gold 50. The XTR parts arrived today, so the bike is about to get even lighter...sub 20 lb. maybe?? We'll see. Fitness-wise, I felt pretty good. I was able to hammer a little bit just to test things out, but didn't want to go crazy as I have three more long days of riding ahead of me. I probably will not race the XC this weekend as I couldn't get an answer on whether the women's race was going to get shortened from the 30-mile distance or not. I left the camera at home today, but I'll share any good pics I come across of the course and/or today's ride.